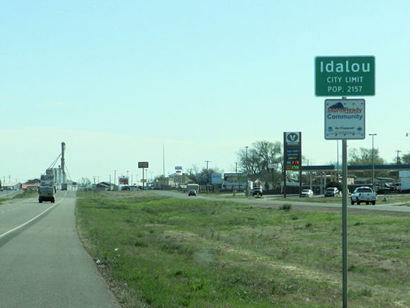 Another town with a disputed name, Idalou was either named after early settlers Lou Bacon and his wife, Ida or after the daughters of Julian M. Bassett who was the vice president of the Crosby-Bassett Livestock Company. The daughters were Ida and Lou. 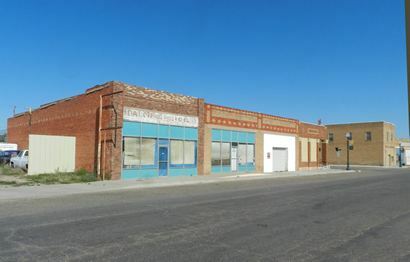 In 1911 when the South Plains and Santa Fe Railway connected Lubbock and Crosbyton, Idalou was given it's own depot on the line. It became a shipping point for cotton and maize. The town was well established by 1916 and it received its post office the next year. A brick school replaced the previous one-room schoolhouse in 1919. 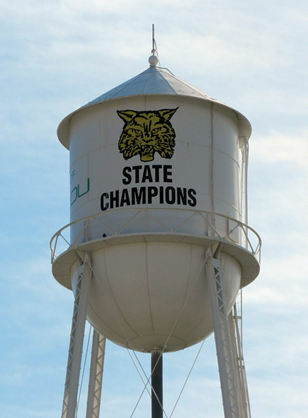 In 1925 Idalou incorporated. 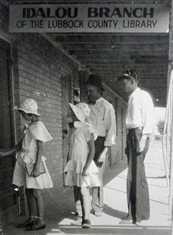 By 1930 there were over 500 Idalouans and nearly 30 businesses. By 1940 the population remained over 500, but barely. The number of businesses actually increased during the Depression - by five. From 1960 to 1980 the population doubled from 1,274 to 2,348. 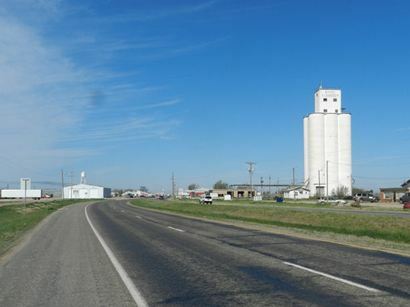 In 1990 the population in Idalou was 2,074 and growth continues at manageable pace. John William Turner, Jr. and his wife, Mary Alice, deeded two acres of their farm as a burial ground in January 1921. The first burial was for their infant nephew, Weldon Fred Turner, whose grave is indicated by a homemade marker. In May of that year, C.J. and Mary Hallmark buried their infant son C.J., and 13-year-old Mable Gladis Andrews was interred in July. 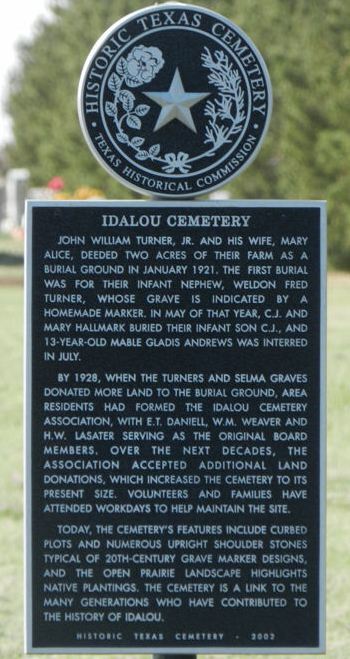 By 1928, when the Turners and Selma Graves donated more land to the burial ground, area residents had formed the Idalou Cemetery Association, with E.T. Daniell, W.M. Weaver and H.W. Lasater serving as the original board members. Over the next decades, the association accepted additional land donations, which increased the cemetery to its present size. Volunteers and families have attended workdays to help maintain the site. 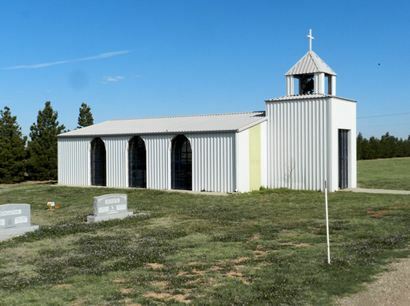 Today, the cemetery's features include curbed plots and numerous upright shoulder stones typical of 20th-century grave marker designs, and the open prairie landscape highlights native plantings. 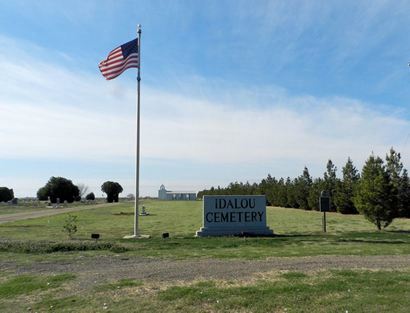 The cemetery is a link to the many generations who have contributed to the history of Idalou.